Brighten your child bedroom or playroom decor with the Sauder Storybook Dresser. Signature features of the Storybook bedroom collection include a soft white finish, classic round knobs and whimsical curves. Bring added storage to your childs bedroom with the Novogratz Addison 6 Drawer Dresser. With ample storage space in its 6 roomy drawers the Scottsdale double dresser is an easy way to keep your belongings organized. All Metal Automotive look chest of Drawers. Shipped completely assembled. Strong construction. 4-Metal Drawers, 1-Flip Top with mirror, Towel Holder and Heavy Duty Wheels. Monterey And Sonoma Collection 5-Drawer Chest. Features Five (5) Drawers That Run On Smooth, All-Metal Roller Glides With Built-In Safety Stops. Other Features Include A Profiled Top, Side Moldings And An Arched Kick Plate. Strong Construction. Easy To Assemble. Monterey Collection: Includes Cherry And White Finish With Dark Pewter Finished Solid Metal Knobs. Sonoma Collection: Includes Black And Maple Finish With Solid Brushed Nickel Knobs. Size: 31 1/2 In. (W) x 16 In. (D) x 45 1/4 In. (H) Weight: 92lbs. See Related Items Below. Dresser has Five Drawers, its available in Beech and Cherry Finish. Size: 31.5 In. (W). x 22 In. (D). x 47.5 In. (H). Easy assembly. Constructed of Medium Density Fiberboard (MDF) and Particle Board. Lifetime warranty on all hardware and 5 year limited warranty on product. Ships ready-to-assemble. Overall Dimensions are 50.063in H x 35.75in W x 21.75in D. Features six drawers on metal drawer glides. Jumbo Deep 5 Drawer Chest. Metal Glides. Easy to assemble. Strong Construction. Available in Beech, Cherry, Mahogany, White, Black and French Walnut. Chest Of Drawers. This Chest Has Five Drawers. Easy To Assemble. Strong Construction. Dimensions: 25.5W. X 15.5D. X 43H..
Lovely 5 Drawer Chest Perfect For Any Area. Strong Construction. Easy To Assemble. Size: 31.5 In. (L) x 20 In. (W) x 47.3 In. (H). Chest Of Drawers. This Chest Has Four Drawers and It Is Easy To Assemble. Strong Construction. Dimensions: 25.5W. X 15.5D. X 35H..
5 Drawer Chest with 1 Door with Shelf. Available in Beech, Mahogany and White. Size: 48W x 22D x 47H. All Measurements Are Approx. Solid Wood Queen Ann Style Dresser. Comes with 5-Drawers and Antique Silver Handle. No assembly required. Strong Construction. Available in Cherry, Hone Oak and Espresso Finish. 4 Drawer Chest in Beech and Light Cherry. Size: 31W x 15 5/8D x 34 7/8H. All Measurements Are Approx. Mission Oak Finish Chest. Size: Lenght: 32 X Width: 19 X Height: 46. Strong Construction. Easy To Assemble. 5-Drawer Chest. Easy To Assemble. Strong Construction. Natural Finish. Dimensions: 46.5 In. X 15.7 In. X 30 In.(H). Brandon Collection Chest. Size: Lenght: 34-1/4 X Width: 19 X Height: 46. Strong Construction. Easy To Assemble. Everyone needs storage space. 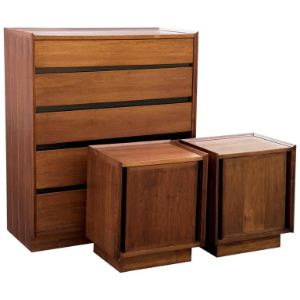 These chests are the perfect affordable, stylish solution. Beefy looking solid 2 thick legs add style as well as strength. Real bead-board panels provide the latest look in fashionable furniture. The simple design assures that they will blend well in any room in the home especially the bedroom. 3077 Features: Constructed from durable melamine laminated particle board Full height (5) drawer sides Easy glide drawer guides and roomy insides Light and strong Solid leg supports Beadboard side panels Solid metal cup handles Easy to clean Made in the USA Assembly required Available in Walnut, Cherry, Black, White and Oak Finishes. Dimensions: 28+ In. (W) x 16 In. (D) x 44+ In. (H) Item Weight: Approximately 75 lbs. Antique White Finish Solid Wood Chest. Size: Lenght: 34-1/4 X 18D. X Height: 45-1/2. Strong Construction. Easy To Assemble. Chest Of Six Drawers. Strong Construction. This Chest Is Also Available In Custom Sizes. If You Would Like A Particular Size, Please Indicate The Size In The Shipping Comments Box Or Contact Us Via Email Or Telephone. This product is shipped fully assembled or can be shipped unassembled upon request.Size: 18 In.(W). x 16 In.(D). x 53 In.(H). *Local Delivery Or Store Pick Up Only. Click Here For Delivery Areas.Hand Crafted In The USA. Quantity Discount Is Available. 5 Drawer Chest in Solid Wood. Available in Honey Pine and Natural. Strong Construction. Easy To Assemble. Size: 30 In. (W) x 17 In. (D) x 45 In. (H). Madison Collection 5 Drawer Chest In Sand Finish. Size: Lenght: 43 X 19D. X Height: 50. Strong Construction. Easy To Assemble.